When you need the absolute best golf laser rangefinder on the market, you can hardly go any higher than the Bushnell Unisex Tour V4 Shift. 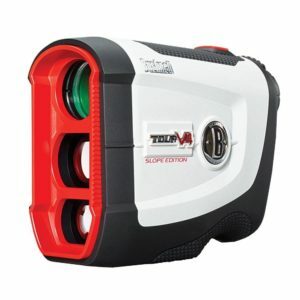 This rangefinder is designed for golf use, but can work just as well for other purposes, although you may need to look into an alternative body design if you want to bring it out hunting. One of the more attractive features for competitive golfers is the ability to switch the device to a completely tournament-legal mode with a single switch, thanks to the special Bushnell slope functionality. On the other hand, you can still use the device in its full range of capabilities by disabling the mode, ideal for when you’re playing regularly and not in a tournament. Its measurements are accurate from 5 to 1,000 yards, with a 1-yard precision. Flags can be measured up to 400 yards. You can additionally zoom in on your target with a 5x optical magnification, and the device makes the picture extra sharp and clear to bring out the important details. Bushnell actually surprised us with the quality of the optics featured in this model – even though it’s clearly a premium device, we still didn’t expect to see this kind of definition in the picture. Bushnell Unisex Tour V4 Shift is highly intuitive to use as well, with a subtle vibration notifying you when the target has been located. The buzz is still light enough that it won’t interrupt your actual aiming, and it shouldn’t have any noticeable effect on the device’s battery life either. You don’t have to use it if you feel like it messes up with your playing, and some people choose to use the rangefinder in its regular mode instead, even in standard non-competitive play. Other than that, you can expect the standard range of extra features you’d get from a device in this price class, such as a special carrying case, included battery, and other accessories to make your life easier when using the rangefinder. The company is serious about the long-term durability of the model as well, offering a 2-year warranty on your purchase.